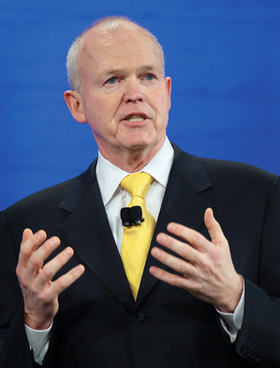 New NADA Chairman John McEleney: "We've got to tell our story." John McEleney, the incoming chairman of NADA, urged Congress to hold hearings to assess how many jobs would be lost if vehicle emissions were regulated state by state. "We hope that the president and the EPA administrator realize that a single national fuel economy standard is smarter than a patchwork of state regulations that will only further endanger our industry," McEleney told dealers at the general session of the convention today. The industry lost almost 1,000 dealerships last year at the cost of more than 50,000 jobs, he said. The Obama administration has directed the EPA to review authorizing state regulation of vehicle emissions. The issue is driven by a California Air Resources Board attempt to impose vehicle emissions standards in that state that are stricter than current federal standards. McEleney urged dealers to tell state and local officials "again and again" how important dealerships are in terms of taxes, jobs and community organizations. He said that by the end of this year, 1,200 more dealers will have left the business. In a year when sales will likely be 12 million units, McEleney said, "we've got to tell our story." Dealers must protect their businesses so that when the business cycle turns "we are in the position to thrive," he said. McEleney added: "Let me assure you, I'm absolutely committed to protecting the franchise story and our way of business."